U.S. Coast Guard Pacific Area Dec 1, 2018. SEATTLE – The crew of the U.S. Coast Guard Cutter Healy returned home Friday to their homeport in Seattle following a four-month deployment in the Arctic. In addition to providing presence and access in the Arctic during the 129-day summer deployment, the Healy crew completed three research missions in partnership with the National Science Foundation, the National Oceanic and Atmospheric Administration and the Office of Naval Research, conducting physical and biological research in the Arctic Ocean. The crew’s first mission was a NOAA-sponsored project aimed at furthering the understanding of the changing biological picture in the Arctic, along with studying the physical oceanography and offshore ocean currents in both the Chukchi and Beaufort Seas. The findings from this mission will aid scientists in studying the biological conditions in the Polar region. 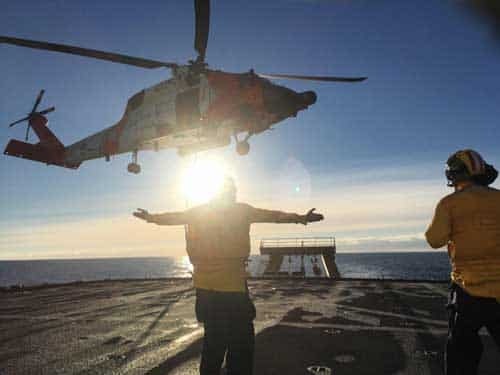 A Coast Guard Air Station Sitka MH-60 Jayhawk helicopter aircrew conducts deck-landing evolutions with Coast Guard Cutter Healy. Pilots practice landing on the cutter while at sea to maintain proficiencies. U.S. Coast Guard photo by Lt. Kellen Browne. Healy’s final mission, sponsored by the National Science Foundation, was aimed at understanding the effects of the Pacific and Atlantic water-inflow and the associated boundary current in the Arctic ecosystem. As part of a multi-year endeavor, this study captures measurements from subsurface moorings deployed on the Barrow Canyon Slope as well as data collected from Healy’s onboard scientific equipment. Under the command of U.S. Coast Guard Capt. Greg Tlapa, the Healy is the nation’s premiere high-latitude research vessel and is the only U.S. military surface vessel that deploys to and is capable of operating in the ice-covered waters of the Arctic. 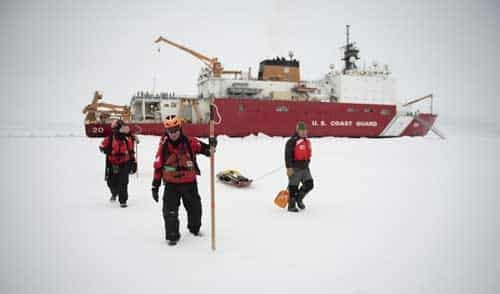 In addition to science operations, Healy is capable of conducting a range of Coast Guard operations such as search and rescue, ship escorts, environmental protection and the enforcement of laws and treaties in the Polar Regions. Healy provides access and presence throughout the Arctic region to protect U.S. maritime borders and to safeguard the maritime economy. At 420-feet long with a displacement of over 16,000 tons and a permanent crew of 87, Healy is the largest ship in the U.S. Coast Guard. Commissioned in 2000, Healy is one of two active icebreakers in the U.S. fleet; the other is the Coast Guard Cutter Polar Star, the service’s only heavy icebreaker, homeported in Seattle. Commissioned in 1976, the Polar Star recently departed for a four-month Antarctic deployment to support Operation Deep Freeze 2019. Operation Deep Freeze is the logistical support provided by the U.S. Armed Forces to the U.S. Antarctic Program. During Operation Deep Freeze the Polar Star carves a navigable path through seasonal and multi-year ice, sometimes as much as 10-feet thick, for supply ships to deliver annual operating supplies and fuel to National Science Foundation research stations in Antarctica.